My very first triathlon was the result of a wager with a friend over a few drinks. He had often talked about racing and during the year you would see his physical appearance change dramatically as the racing season kicked in.. I was far from fit, smoked heavily and was fond of a few beers. I couldn’t really swim, didn’t own a bike and was a disaster when it came to running. The most I had run in a long time was after one of my kids when they got a bit carried away on their bike. For me, triathlon racing was the best thing I ever did and I reckon it saved my life. First thing I did was gave up smoking – easier said than done – but I got there with the help of nicotine patches and determination. Within about a week or so I already felt better and this gave me the lift I needed to move on to planning out how I was actually going to compete in my first race. Nothing helps you focus more than a deadline so I set a goal of a local sprint triathlon. Because I couldn’t really swim this one suited me because it was in a river and was all downstream. I bought a cheap racing bike on one of the adverts sites and invested in a pair of cycling shoes – I have massive feet so got a great deal on a pair of Specialized bike shoes that I still have today that were being sold off. In fairness, I did a bit of research on the gear required for a triathlon so sort of knew what I needed. I bought my first wetsuit, tri suit and goggles off Amazon. Money was tight and I didn’t want to invest too much at the beginning in case I didn’t stick with it. I have taken up new hobbies in the past and done nothing except waste money. This time was different because my health and the chance to spend happy years with my kids depended on it. For me, swimming was always going to be my biggest challenge so I set about re-learning how to swim. This started off very slowly twice a week in the local pool. It was breaststroke all the way as I couldn’t ever get the hand of breathing during the front crawl. The local pool is small and I had calculated that I needed to complete 37.5 lengths to match the 750m swim in the Sprint triathlon race. Believe me when I say this was challenging for me but the more I practised the better I got and eventually swam the full distance without stopping. I didn’t care about time or technique – for me, it was just about getting to the final lap and not drowning. When I started out I was hitting about 20 stone in weight but the swimming really helped me shed some of this weight. It also helped me loosen up my joints and exercise muscles that hadn’t been used for quite some time. The only other equipment you need is a set of goggles. 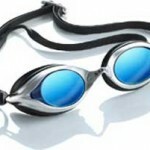 My first pair were the Aquasphere Kayenne goggles. I bought these because they give you that bit extra viewing and are very comfortable. They also stay in place without sucking the eyes out of your head. Most races give you a swimming hat but pack one just in case. If you have an old pair of flip-flops or cheap runners throw them in the bag too. You may have to walk from transition to the starting point for the swim so look after your feet on the way. Anything else is a nice to have. The next task at hand was to get some practice out on the bike. I bought my original bike from an Adverts site and just picked the one that looked cool. 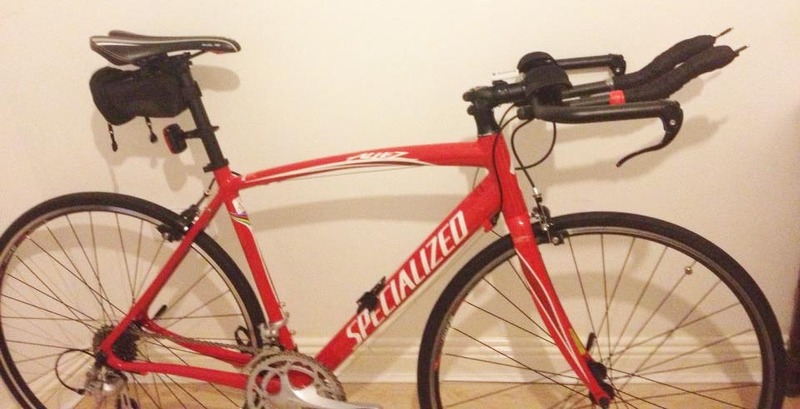 It was a Specialized Allez and was perfect for my first few races. Bike prices can be anything from a few hundred dollars into the tens of thousands of dollars so choose wisely. Anything will do for your first race and I still see people competing on mountain bikes so don’t panic and splash out your cash on a new bike unless you have to. I rushed off to the shops and picked up a pair of new bike shoes and was so excited to get out there and start practising. Unfortunately, though I forgot to check the pedals on the bike and ended up with the wrong cleats. Once I picked up new cleats I was good to go. This was the same as the Sprint distance so though if I can do this straight off the bat I’m good to go on race day. The ride itself was great although I did have to get off the bike every time I hit a hill. This shows how unfit I was back then. The challenge came two days after the bike ride. I was as stiff as an iron bar and had to walk sideways up and down the stairs in my house because all my leg muscles had seized up. It wasn’t funny at the time but my family did have a good laugh at my expense. Over the 12 week period, I reckon I got out maybe twice a week on the bike and just kept it simple. I didn’t worry about speed or anything fancy – at the time it was just about distance and control. 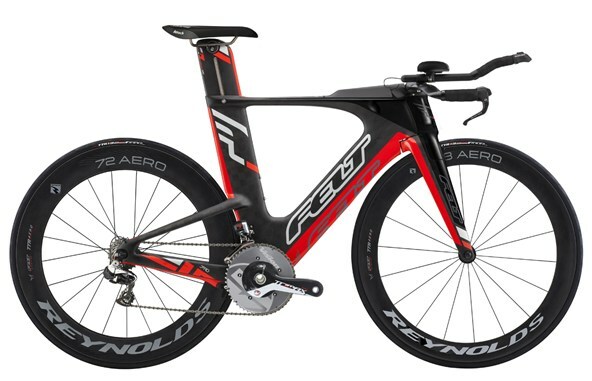 I did, however, invest in a set of triathlon tt bars, some bar end shifters and brake levers to help me get more aero – it still feels cool saying that ‘get more aero’ but it does make a difference to your race times. Everything else on the bike remained stock. When you think of how much money and time you can invest in a TT bike I was very happy with my cheap Allez at the time and still use it for practice runs today. What gear do you need for Cycling? Helmets are mandatory and must be worn in transition as well as the race. A quick tip here is to put your helmet on as soon as you remove your wetsuit. It’s very easy to forget things in transition but you risk being disqualified if you don’t wear a helmet so get clipped in early. As mentioned earlier I invested in a decent pair of bike shoes early on but you can pick up a pair for well under 100 bucks so shop around for the best deals. We have a review here of bike shoes for triathlon if you want to check it out. I mentioned at the start of this post that I was a rubbish runner – still not brilliant but I get by. When I started training for my first race I walked a bit, jugged a bit and walked a bit more. Think of it as a couch to 5k training exercise and that would have been me. I was very unfit and while the swimming and cycling definitely helped I was still a very bad runner. I live near a 1k track so started practising twice a week to build myself up. After about 6 weeks I could manage to complete the 5k in a single run – not fast by any stretch of the imagination but I could do it. What gear do you need for triathlon running? Realistically all you need is a pair of runners and a tri suit. 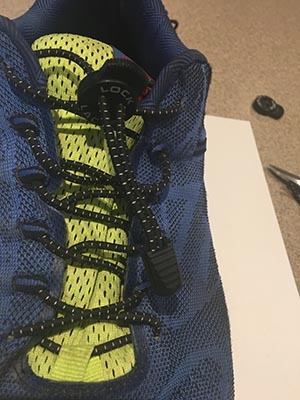 One thing I would definitely invest in for your runners is a pair of lock laces or stretch laces so you don’t have to worry about knots holding you up in transition. A tri suit is very handy but not something you might invest in for your first race. You wear all your clothes for the bike and run under your wetsuit so think about getting a suit before your first race. On a sunny day, you might need a pair of tri sunglasses and a hat to keep the sun and heat off your head. Remember it may not be too hot or bright when you pack the gear up for a race but conditions can change quickly so be prepared. Once it got a bit closer to race day I decided to try and train all three disciplines on the one day and see how I got on. While it wasn’t ideal running from the swimming pool into the gym to hop on an exercise bike I said I’d give it a try. I can’t really explain the feeling of accomplishment when I finished the treadmill run but it was a bit overwhelming, to be honest. Apart from the fact that I had completed all three distances in the one go I felt ready for the race and compared to where I started from it was massive for me personally. This was probably a turning point for me as I now knew I had it in me to compete on the day. The final learning experience for me was the night before race day and on the day itself. I had everything packed up in my triathlon bag and ready to go. I must have unpacked it 100 times and double checked it to make sure I had everything. I strongly recommend writing out a quick checklist so you can tick things off as they go into the bag. If you are organised at this stage then things go a lot smoother on race day. When it came to race day I hadn’t a clue what to do. I knew I had to be in transition at a set time but that was it. I was on my own for the first race so just looked around me to see what others were doing and followed along if it felt right. I brought all my gear transition area, racked my bike and then laid out a small towel beside the front wheel of my bike. On this towel went my runners and a drink. With the bike on the rack, I stuck my helmet onto the tt bars and popped my sunglasses inside. My wetsuit, along with my goggles and hat were ready to go. When I registered for the race I received a race number and a colour-coded swimming hat for my specific wave. I didn’t have a race belt at the time so just used a few safety pins to fix the race number to my tri suit. 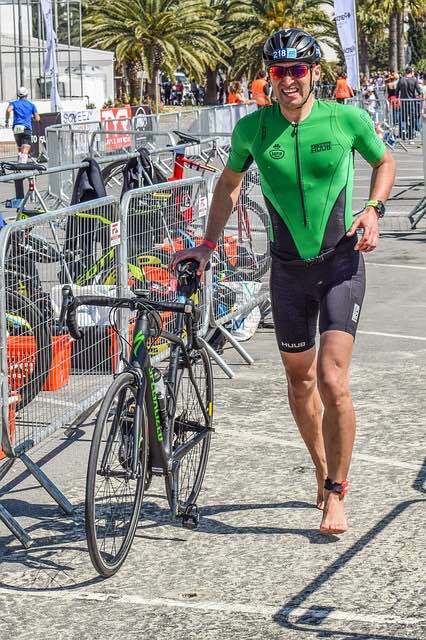 I suppose, to sum up, my experiences from my first foray into triathlon I would have to say that initially, it was a scary feeling that was eventually replaced by a massive feeling of accomplishment. I was unfit, overweight, smoked like a chimney and was definitely heading for a stroke. I am well over 40 now and still remember the day I crossed the finish line at my first race. I still complete today, have invested a bit more in upgrading my equipment but race for fun and don’t try to compete with the more experienced folks out there. 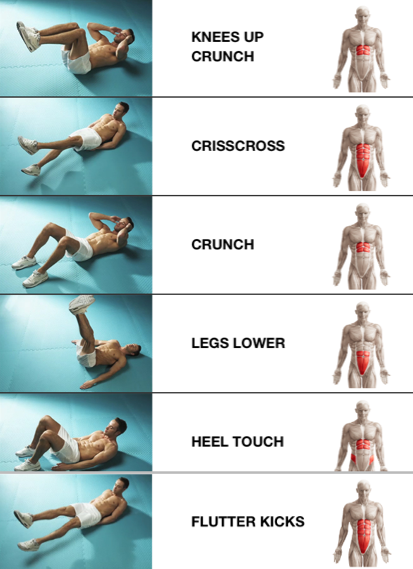 Today we are going to concentrate on lower ab workouts as part of our core strengthening exercises. Below is a visual aid that shows the targeted muscles and lists off the exercises we will do to build muscle. Lower Ab muscles are one of the harder sets to work on. This is probably the last muscle group that you will see noticeable good definition. Whilst not all exercises below are to directly target the lower Abs, you should still perform them to keep a balanced core. I am going to show some relevant videos to give you more of a view on how you can complete these lower Ab workouts successfully. Do them wrong and all you will gain is lower back pain. First lie on your back, knees bent and your hands behind your ears. Lift your feet a few inches off the floor and hold them there. Crunch forward then lower your torso back to the floor, keep your feet off the floor throughout the movement. Lie on your back, reach your hands behind your head. Bring your legs up to tabletop position, one at a time. On the exhale, rotate your ribcage to the left. Bend left knee and bring it toward your right arm. Switch, bringing your right knee as close as you can to your left arm. Bend your knees and keep feet flat on the floor. Cross your arms in front of your chest. Ease back down slowly as you inhale. Stretch arms out fully. Palms flat on the floor. Lay down on on the floor with your knees bent,feet flat and slightly wider than shoulder width apart. Extend your arms towards your feet with palms facing inwards. While exhaling, crunch your abs and try to catch your right ankle with the right extended arm, pause for one second. Move back to start position and inhale as you go. This exercise plan is part of our core exercise workout set. 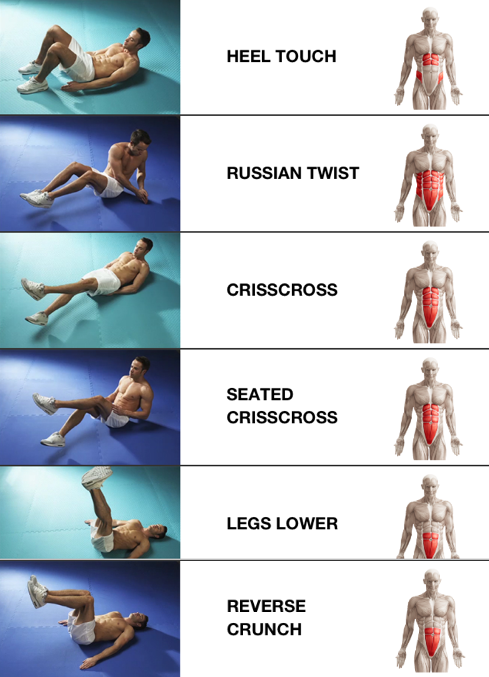 Lower Ab Workouts form a key part of this. Core strength is a fundamental part of strength conditioning for all triathletes and one that you should definitely work on. It will help in all three stages of the race. Core strength really helps on the bike as you will spend a fair bit on time locked in the aero position. Let us know if there is anything you feel we should add to this. There are a million exercises you can incorporate in your lower ab workouts but we feel these are the main ones to concentrate on. As always you perform these exercises at your own risk so be sure to work within your own boundaries and seek medical advise if you feel you have overdone it. is available now on the App Store. Go grab yours today. 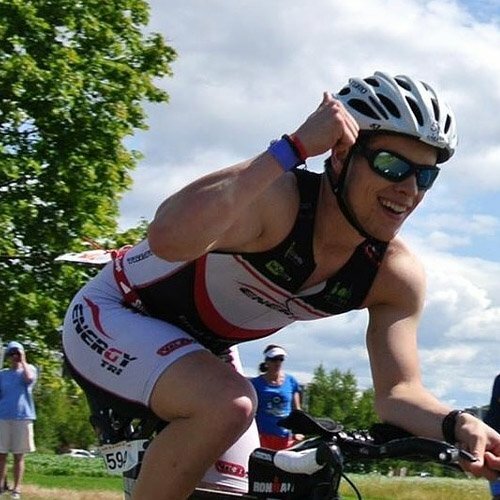 When I first started out on my Triathlon journey I had no idea what to expect, what I needed or how much effort would be required for training for a triathlon racing or to even finish a race. Fitness would not be one of my strongest points. To be honest it all came about after a bet over a few beers. Once the first race was over the planning started pretty much straight away for the next race. First things first – Set a distance and stick to it. There are really three triathlon race distances you need to consider. Each comes with its own challenges and highs and lows. The type of race you go for will really dictate the type of things you focus on while training for a triathlon. Here is a brief overview of each of the triathlon distances you need to consider. Next up is the Olympic distance triathlon. Think of it as a sprint and then double it. Both in distance and demand on the body. Because this is still considered a short-ish race the pace is full on as well. This really is the mother of all races and one that requires as much mental fitness as is does physical fitness to compete and complete. Lots of people will say this is a very lonely experience while you are out on the course and you have to stay very focused or else your brain starts to play tricks on you – ending in the dreaded DNF (did not finish). Its on my to-do list but I’m at least a year out yet. The IronMan distance triathlon is like nothing you will have ever experienced before so do your research and give yourself plenty of time. It is a huge commitment so make sure you have support from friend and family before you commit. I plan to compete at sprint distance for another season yet to make sure all my body parts are still up to the job. As I pointed out earlier once I had completed the first race I got straight into planning the next one. Hooked straight away to be honest and this is a very common experience for most budding triathletes. At this point I thought I was an Olympic athlete and started looking around at the rest of the gear the other triathletes were using. Yep I definitely need a full aero bike, the best wetsuit and all the top of the range gear if I want to complete and ‘look the part’ next time out. Hold on there a second – no panic just yet. There are some essentials that you do need for racing and the following section will cover off on this in more detail. When you train for triathlon racing you need to start off slow and gradually work your way up. Don’t focus too much on the required distances at the outset. I will always train longer and further prior to race day now but in the beginning it was just small sessions to build up fitness and core strength. The distance and stamina to go further comes with time. My gear at my first triathlon all fitted into a plastic bag. Except for the helmet and bike… The wetsuit I bought online looked cool but was completely unsuitable for racing. Handy for scuba diving though, and it was a bit short so I had difficulty standing up straight but still it looked cool. Everybody else were togged out in their slick black racing suits while I my suit had sort of a neon blue glow off it. Could have seen me from space but I floated down the first leg of the course like a cork so I wasn’t complaining. Anyway back to the triathlon gear list. A good wetsuit is very important when it comes to triathlon swimming.For starters it will help to keep you warm when you are swimming in cold water. A decent set of goggles is also essential if you want to be able to see where you are going. Make sure you have them adjusted correctly or they will get kicked off your head during the race. Stay tuned for the next update to this section where we will be covering off the Bike element of the race. So what is a triathlon… The first modern day triathlon took place in Mission Bay in 1974 and was setup by the San Diego Track and Field Club. It was created as an alternative to athletic track training. Today Triathlon is one of the fastest growing sports in the world and it’s a sport that caters for all age groups, varied fitness levels, and from beginner try-a-tri right up to the Ironman championships. The triathlon consists of set distances of swimming, biking, and running – one after the other. You are timed from the second you jump into the water and set off. Even the time it takes for you to change gear or get off your bike and start the run (transition) is included. By design the triathlon tests your ability in multiple disciplines – swim, bike, run. It is much more than just a simple race – what is a triathlon – its a mental as well as physical endurance race. Most people who get into triathlon will have completed in some sort of sporting event on one of the disciplines in the past. You may have been a good swimmer in the past, good on the bike or maybe run some short to medium races. One thing that appeals to so many people about Triathlon races are because most of the time you are split up into age groups. This means you can race or even complete with all of your friends which is great fun and makes it very interesting. The primary distances for triathlon are outlined in the chart below. 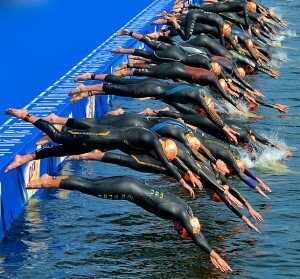 There are many variations of Triathlon but we will be focusing on just the primary one man distances. As highlighted earlier, each competitor has to go through a timed transition from swim to bike(T1), and then from bike to run(T2). You will set up all your gear at the transition area before you start your race. Bikes will have to be racked at your designated area and you are allowed to keep a limited amount of race kit here as well. Most people will lay out a small mat on the ground and put their runners etc onto this. No bags etc are to be left in this area. Doing so can incur a penalty or even disqualification from the race. One point to make here is to relax and enjoy the atmosphere at the transition area pre-race. You will see and talk to all levels of athletes from novice right up to expert so listen and learn from others while you are there. One thing I will say is that Triathlon racing is very addictive. Once you cross the line on your first sprint race you are hooked. You will have already trained hard for the sprint race beforehand so should be feeling the huge benefits of your fitness levels improving anyway. If you are considering a triathlon then I strongly advise you to go for it. The feeling of crossing the finish line after the first race is amazing. If you have completed in the past then keep it up and get out training for your next race. I’ll leave you with a short inspirational video to give you a taste of Triathlon. Enjoy! Here is an amazing HIIT workout series ranging from easy right up to intense. A major part of you fitness needs to concentrate on your core and these exercises are guaranteed to get the job done. With this series you can start off easy and build yourself up to the intense series over time. Great examples of how to combat knee pain from running. Details on some of the causes, and a selection of exercises and video links that will show you can overcome this pain and get back out running today. The most common injury that runners develop is patellofemoral pain syndrome. This knee pain from running, also known as runner’s knee or anterior knee pain, accounts for about 1 in 5 of all injuries to runners. The primary symptom is pain under the kneecap that begins as a mild pain but ends up becoming more intense as running goes on. If you keep training on this knee, the sensation becomes even more intense. There are quite a few theories about the type of damage that creates this pain. The reason for these different ideas is that, in contrast with other maladies like meniscus damage, patellofemoral pain syndrome has no structural anomaly that shows up on an X-ray, arthroscope or MRI. This has recently led orthopedists to look at patellofemoral pain syndrome as a condition in which the pain itself is the main part of the injury. 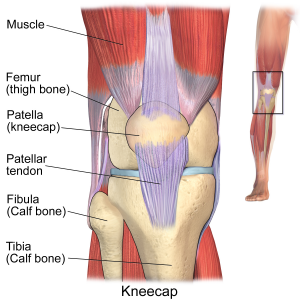 Many different types of minor tissue decay, like swelling in the synovium (that pouch that holds lubricating fluid for the knee), can cause knee pain after running. However, because these breakdowns are not always easy to identify, it is not necessary to target them. Instead, it is important to focus on the pain. The first step for this is to avoid any activity that makes your knee hurt, including running. However, if you can run without pain, then you should run. Using this strategy will help the damaged tissue rebuild homeostasis, which is the state of breaking down and regenerating. This will also ensure that your knee remains well adapted for running. Many people who have patellofemoral pain syndrome can get some running in without pain. Some find that they can run for a particular amount of time, like half an hour, without pain, but then the pain starts later. If this is the case for you, just run until you sense your limit coming. As you improve, your limit should increase, as should your running frequency. After you have done this for several weeks, try to run the day after your last run to see if that limit is still in place. Keep building your running until you approach your levels before the injury. When you have soreness, give the whole area a day off. When you do have pain, treat the underlying inflammation. If you take ibuprofen and ice your knee three times a day, 10 minutes each time, this can help the swelling go away sooner. If your knees knock together, teach yourself to actively use the muscles on the exterior of your hips as you run, so that your pelvis will remain level and your thighs will remain in their natural positioning. Exercising to strengthen these muscles is quite important. Another important risk factor for patellofemoral pain syndrome is over striding or heel striking. 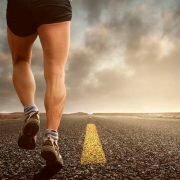 Research is still necessary to prove that there is a link between the two, but studies have discovered that runners with extreme amounts of impact shock on their joints are more likely to end up with patellofemoral pain syndrome. Because heel strikers bring more impact shock than runners who strike with the midfoot, it’s important to train yourself to shorten your stride and land that food flat beneath the hips instead of landing with the heel first, out ahead of the body. If cutting down on impact shock effectively reduces your risk of patellofemoral pain syndrome, then if you change to running shoes that cut down on impact shock, you may also end up helping your knees. The problem with this switch is that the connection between impact shock and shoe cushioning has not been clearly established. Some research has found that softer cushioning in running shoes actually gives you more impact forces, because you unconsciously adjust your stride to account for the cushioning. Some have suggested, though, that it is a lack of proper measurement techniques that has led to inconsistent results. Because you can’t go through a comprehensive impact test when you are out shopping for the right running shoes, it is not always easy to know how to select the right shoe, with the correct amount of cushioning to minimize your risk of patellofemoral pain syndrome? Research shows that comfort is one of the most reliable metrics for this. Subjective tests of comfort combined with experiences from the road are even more effective. To start, purchase and use the most comfortable footwear you can find out there. If you run without injury, buy another pair, or the successor shoe as far as your manufacturer goes. If you have an injury while wearing that shoe, try a different model with less or more cushioning that also provides comfort. Keep on testing with different models until you find the very best for your foot. While no shoe will prevent all injuries, finding the best shoe for your foot helps you out considerably. Overall, patellofemoral pain syndrome is actually fairly minor as far as conditions go. 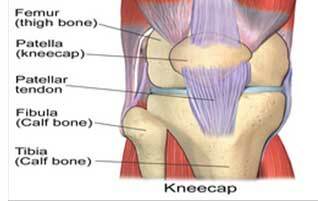 Really, it is just a tissue failure within the knee, in which recovery from runs simply does not take place. The bad news about patellofemoral pain syndrome is that it can feel as paralyzing and last just as long as more serious conditions. Putting these tips to work for you will help you get back out there training a lot more quickly. A couple of exercises you can work on for strengthening other leg muscles, that can help with this pain are detailed in videos below. Please consult a Physical Therapist before you work on any of these and do not take the content above as medical advise. It is purely a description of one of the pains runners get in their knees. Why not check out one of our other really popular posts. This one targets your abdominals. Core strength is key to any good fitness plan and the following shows you how to build up killer Abs. Click the picture below to take a look. Have you ever asked yourself – How can I get amazing abs without any gym equipment? Well, here you go. This ab workout you can do from home should help you out. Build killer abs by following this set of pictorials. I was always healthy and only ate 3 meals a day but kept gaining fat. No amount of working out could give me Abs I could be proud of. Click the image or link and watch the FREE video. You will be very surprised at the results. Working on your abs can be a bit of a chore but if you stick to this set of ab exercises you will see results in no time at all. Abs are probably one of the last muscle groups that show up so you really need to work hard to build up the definition in your abdominal area. This is the best way to build amazing abs from home. No expensive equipment required – just follow along and keep at it. The best ab workout is the one you can complete without harm or injury. This series is broken out into beginner, intermediate and advanced ab workouts, so you can go along at your own pace. You will also need to look at your diet for ab definition. Doing all these exercises is great and will help you build up core abdominal strength, but if you don’t watch what you eat you will never see the results as your killer abs will be hidden behind a layer of ‘padding’. Stick to healthy fat-free foods as part of a balanced diet and things will improve dramatically – apart from the fact that your overall health will improve as part of this fitness program. You will also be advised to mix in some cardio as part of this exercise plan. Building up your fitness levels overall will really help you and by making small lifestyle changes you will get fitter and healthier. There are benefits to this that far outweigh a set of defined abs but that’s for another post at a later date. Hope you enjoy the workouts and remember to take it easy. These images are for guidance only and if you feel any pain or discomfort then stop immediately and seek the advice of a professional before you continue. Best of luck with your new killer abs. Thanks for stopping by our site. We have a lot more information available on our homepage on the best triathlon gear with some awesome reviews and seriously good deals. We would also appreciate you sharing this page with your friends if you found it useful by clicking one of our social buttons.